Planning a road trip in France? Moving to the French countryside and taking your car with you? Whatever your situation, if you’re planning to get behind the wheel in France, it’s important to be aware of the regulations in place. Find out all about these rules, with tips and more below. In France, vehicles are driven on the right side of the road, and contrary to countries such as the United Kingdom. Consequently, overtaking is done on the left. You must be over 18 to drive in France - again, contrary to places like the United Kingdom and the United States where the minimum age is set to 17. Drivers with under 3 years of experience on the road are kept to a blood alcohol limit of 0.2 grams/litre, as opposed to 0.5 grams/litre for other drivers in France. The French police is in right to carry out breath tests at random and will do so automatically for all drivers involved in a car offence or accident. The best way to avoid any troubles will simply to not drink at all before hitting the road. French driving laws prohibits the use of headphones and headsets under all circumstances whilst driving, the only exception to this being integrated headsets for motorcyclist helmets. Phones can only be used via a fully fitted wireless Bluetooth car kit. In major cities such as Paris, Lyon, Lille, or Marseille, a Low Emission Zone measure has been implemented in order to improve air quality. During days of high pollution levels, only vehicles displaying the "Crit’Air" sticker on their windscreen will be able to circulate. You shouldn’t be bothered with this regulation during a short tourist trip, unless it unfortunately falls on a high pollution day. The very French-specific “Priorité a droite” road sign, which is often put up in built-up areas, means you need to give way to traffic coming from the right. It is a by default rule, meaning that if you come to a crossing without any road signs saying otherwise you have to give way to vehicles on your right. Children under 10 kg (22 lbs) In a rear-facing seat, either in the front passenger seat (with deactivated passenger airbag) or a back seat. Children between 9 kg (20 lbs) and 18 kg (40 lbs) In a child seat including a harness or protection tray. Children between 15 kg (33 lbs) and 36 kg (80 lbs) In a booster seat, used in conjunction with an adult seatbelt. Regardless of weight, children under 10 years old are not allowed to travel in the front seat without a child restraint. The only exceptions to this are if there are no rear seats in the vehicle, if the rear seats are already occupied or if there are no seat belts in the vehicle. Since July 1st, 2018, the speed limit on single carriageway roads without a separating guard rail has been brought down from 90 km/h (55 mph) to 80 km/h (50 mph). It is strictly forbidden to carry radars in a vehicle, and failure to comply can entail a €1,500 fine or even getting your vehicle confiscated. If your Sat Nav have the radar-detector technology, with maps showing the location of speed cameras along your journey, you will need to deactivate this feature before hitting the road in France. One of the most important rules to keep in mind is to never stop or park on a single yellow line, as this will result in either a fine or the car getting towed away. A broken yellow line indicated stopping is permitted, but parking isn’t. Make sure you gather all the relevant items and documents for driving in France ahead of time, to ensure your trip goes as smoothly and safely as possible. Find the details below. Insurance Documents: make sure to check whether your insurance policy will properly cover you during the full length of your stay in France (some policies may only be fully comprehensive in your home country; and only offer minimal, third-party care when abroad). Also make sure to keep your insurance company’s phone number at hand in case you ever need. Even better, take out a European Breakdown Coverage to put your mind at complete ease. 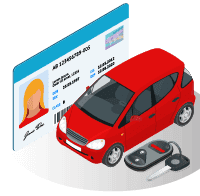 The following items are mandatory to have in a vehicle in France at any given time, and failure to comply to this rule can incur an on-the-spot fine. It is recommended that you get your hands on an AA kit for travels in Europe, that will contain all the essential accessories for safe driving in France, ahead of time. These are readily available to order online for under €30. Headlamp converters: under French law (and most European countries), it is obligatory to have a set of headlamp converters fitted in your vehicle. These act as headlight beam deflectors, and prevent potential accidents caused by shining headlights directly onto oncoming traffic. Failure to respect this rule can lead to a €90 fine. Spare bulbs: carrying spare bulbs is an obligatory precautionary measure, in order to be able to change out faulty ones there and then. Failure to respect this rule can lead to a €80 fine. High visibility vest: these reflective jackets were introduced in 2016 as a mandatory feature to carry in any car in France. These should be stored in the car cabin and not the boot, and doing the latter could make them harder and dangerous to access. Indeed, the unlikely event of an accident, or a breakdown, you and all the passengers will need to stand next to the vehicle on the hard shoulder or roadside, and each wear a high visibility vest (you should thus plan to have the appropriate number of vests in your vehicle depending on how many people you usual travel with). This law applies to motorcyclists too. Failure to respect this rule can lead to a €135 fine. Warning triangle: this device needs to be in a car at all times, and in the case of an accident, placed on the hard shoulder ahead of the scene, as a warning signal to oncoming vehicles. Failure to respect this rule can lead to a €135 fine. Your country sticker (GB sticker for British drivers for instance)/ you need to display the official sticker relative to your country of origin, on the rear of your vehicle. Failure to respect this rule can lead to a €90 fine. Breathalyser: the French government planned to establish a small fine for any drivers not carrying a breathalyser in their vehicle, however this never got put into place. Failure to respect this rule thus won’t lead to a fine, but it is greatly recommended to keep an unused, NF-certified, and in-date breathalyser in your car all the same. Note that single-use models have a lifespan of 12 months, so make sure yours is still in-date if you already have one. Helmet and reflective elements for motorcyclists: these are absolutely mandatory for obvious safety purposes, and failure to comply will incur a €135 fine at least. Glasses: if you need glasses to drive your car, it is mandatory in France that you carry a spare pair of glasses in your car at any given time. In the unlikely but serious event of your having a car breakdown in France, don’t call your breakdown insurance company right away. If you’re broken down on the motorway, you will need to use of the orange emergency phones which are found at regular interval along the road on the hard shoulder - just make sure to put yourself and other passengers out of danger and traffic before you do. This orange phone service will put you in contact with a local breakdown company which will tow your vehicle to a recovery zone. 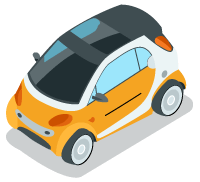 Once this is done, you can then contact your breakdown provider to get the insurance sorted out - ideally, you should take out a European breakdown cover as stated above, so as to see your breakdown taken care of as efficiently as possible. Here is a list of the important emergency phone numbers in France which are handy during your journey.